The Punch/Draw is a technique designed to disrupt a sudden imminent threat who is within touching distance. As you realize the suspect is reaching for a weapon, you simultaneously strike the suspect in the face or chest with your non-gun hand while drawing your weapon as you step back. If the Threat remains within touching distance, employ a combat tuck and shoot him. If not, extend your handgun out, interrupt the eye-target line, reference the sights and/or weapon, and shoot until the imminent deadly threat is stopped. The strike disorients or delays his ability to shoot you while giving you time to get on target. So it makes sense to teach this method when responding to close imminent threats, right? Well, no, not really as it is generally taught. We taught this method in the 1980s before it was widely popularized, and continued until the mid-90s when force-on-force drills began to alert us to a problem—the Punch/Draw didn’t seem to work as advertised. Then came the avalanche of in-car videos, and we began to see officers shoving or striking suspects with too little negative effect, confirming a problem with this method. As many as half of the officers being murdered by gunfire are from contact to three-feet away from the suspects, and suspects almost universally get the first shot off (“Violent Encounters,” FBI, 2006, page 49). Trainers realize that officers need to even up the timelines in the shooting: slowing or stopping the suspect from drawing while creating time for the officer to be able to shoot. The Punch/Draw was developed in response to this perceived need. The strike is intended to disorient the Threat through actual injury or by distracting him sufficiently to enable the officer to draw his/her weapon. The problem with the Punch/Draw is the nature of momentary effects of the strike (if the officer actually makes contact) and the realistic length of time it takes the officer to draw the handgun before the suspect can begin shooting. 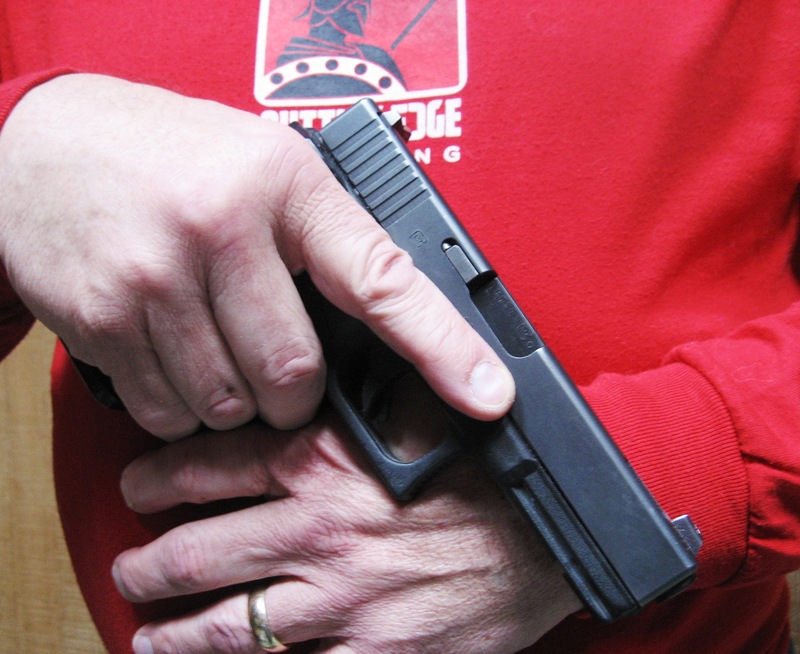 The “punch” is actually a quick palm-heel strike to the face, head, or body concurrent with drawing the handgun. This strike is properly more a “stiff-arm” to the face, rocking the man’s head back or gaining distance from the suspect—either he moves back or the officer is propelled backward, gaining some distance. It is not unusual for any strike to the head to miss completely, or to get only partial contact. Accuracy is important, but so is speed. The moment you orient to his drawing a weapon, you must react. If your hand is not instantly to his face or striking his chest upon orienting, you won’t beat his first shot. The expectation of the effect of the strike must be realistic. Most punches in a fight miss. This one just might miss as well. If you manage to make contact, it will likely be ineffective at stopping his first shot. He may stumble back if hit well, but that may not give you the added time you need. It is highly unlikely to disbalance him and cause him to fall, and an instant knockout is very unlikely. It is not unusual for a draw to take more than one-second from a duty holster in normal circumstances. This means your strike must be effective enough to buy you the time you need to draw your handgun, target the Threat, and fire well enough with enough rounds to stop him from shooting you. Failing that, you are simply in a gunfight. Striking and pushing him back will not likely stop him from shooting. A modification combined with movement may be a better option in certain situations where you choose maneuver to your advantage. The traditional straight palm-heel strike carries your bodyweight either forward into the Threat (resulting in a more effective strike) or, more likely, backward. In either case, the linear movement keeps you anchored in front of the Threat. A static target on his radar is a very dangerous place to be in a gunfight. Rather than a straight palm-heel strike to his nose, a quick lateral palm-strike has proven to be useful. It is similar to a slapping motion and delivered horizontally to his jaw or ear in the same direction you are moving. The strike is combined with the first step (if moving to the right, the right foot steps as the non-gun left hand strikes). The striking surface is ideally the open-handed palm heel. As you move you strike on the way by, draw, circling to keep to his flank or rear as you make your shoot/no-shoot decisions. If you reasonably believe he is a deadly imminent threat, shoot him in the flank or back. Target seek and Put weapons to targets©. If there is an open target, reasonably strike, bite, knee, shove, or shoot with his weapon or with yours. Move in angles and circles©. Whether you are moving or you are physically moving him, all movement is at an angle to or from him, or in a circle. Body parts to body mass©. If you touch him, that body part is welded to your body, forcing him to deal with your body weight rather than just your strength. If you touch his weapon, it gets welded on to him or to you (paying attention to the muzzle direction at all times). Put the resisting suspect to the ground IMMEDIATELY!© As soon as possible, get him to the ground—hard. This may involve takedowns or shooting until he is on the ground and no longer a threat. Don’t fight over a weapon in his waistband or pocket. If you get a hand on his handgun or over his hand holding a handgun in either his pocket or waistband, don’t fight for it—press the weapon into him and just pull the trigger (making sure your leg(s) is not in the line of fire). It’s a deadly force situation, so employ deadly force. Divert the muzzle and bring the weapon to you. Slap at in-hand weapons to divert the muzzle, then press the weapon and his gun-elbow to your body…then fight. If a weapon is within touching distance, slap it, don’t grab. Grabbing is muscular and slow, slapping is quick and uses the weight of your hand (average: three pounds) to move the muzzle. Close rapidly and pull that weapon sideways into your chest, pressing it as hard as possible. Keep the muzzle away from your body parts and toward his. If safe, press the trigger, hitting him or creating a malfunction (and be prepared for the muzzle blast). Strikes can include your forehead to any part of his lower face and nose, and knee strikes to his soft lower parts (groin and thighs), setting him up for you to shoot him or take him down. If safe, draw your weapon and shoot him (proximity shots to the femoral triangle, armpit, or supraclavicular triangle are best, as are shots to the side and rear of the head, neck, or back. Divert the muzzle and shove the weapon into hm. Slap at in-hand weapons to divert the muzzle, then press the weapon into his body…then fight. After slapping it, he may pull the handgun back toward him. Wherever the weapon goes, you must immediately follow and divert that muzzle from you. People are just not prepared to deal with someone shoving something into their body. Drive into him, push that weapon against him, and press the trigger as soon as you can (and not be hit yourself—again, prepare for the muzzle blast). Target seek, draw your weapon when it is safe, and make proximity shots safely. Shove the muzzle into your vest, and press the trigger. A deputy lost his handgun to a suspect and losing the fight, grabbed the suspect’s wrist and pulled the muzzle directly into his ballistic vest, then fired the weapon. The vest contained the bullet. The deputy, expecting the hit, continued to fight and saved his life. Last ditch? Yes, but good to have in your tool box. Instead of the traditionally taught Punch/Draw, we teach to strike, move and hit (with bullets). It makes better tactical sense and is more realistic in the real world where someone is actually attempting to murder you within touching distance. If the Threat is drawing his handgun, it makes better sense to go at him, pin the weapon against his body when it is still in the waistband or pocket, and press the trigger rather than fighting over a handgun. If the weapon is clear of the clothing and in-hand, slapping to divert the weapon, pressing it against something while maintaining awareness of the muzzle’s direction, fighting to gain some type of advantage, and then either taking him to the ground (safer) or standing, draw your weapon and make proximity shots to less defensible targets makes sense. The traditional Punch-Draw technique is problematic, not serving the very real need for which it was designed. Modifying it, striking and moving at an angle to create a distraction while maneuvering to his flanks or back, or dispensing with it altogether in favor of aggressing the suspect’s weapon and using it against him, or immobilizing it while you access your own has proven to be the way to go. Categories: Firearms | Why Do We Teach?